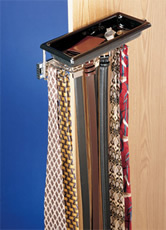 Tie/Belt rack with tray for closet applications. This all-in-one organizer features chrome pegs for up to 20 ties, 5 belts and 4 peg-closure belts. Each set includes a spacious tray for storing loose items like wallets, jewelry, etc. Conveniently pulls out of the closet for easly access on full-extension slides. Clothing carrier. Mounts under closet shelves greatly increasing capacity, and making garments more accessible. Packaged one per box,with screws.